Today around 7pm the roller coaster "Hollywood Rip, Ride and Rockit" at Universal Studios suffered a massive glitch which caused the ride to stop just before the end of the lift hill. Where the ride stopped it's impossible to evacuate the riders via normal means. Universal Orlando called in Fire Rescue to help with the situation. 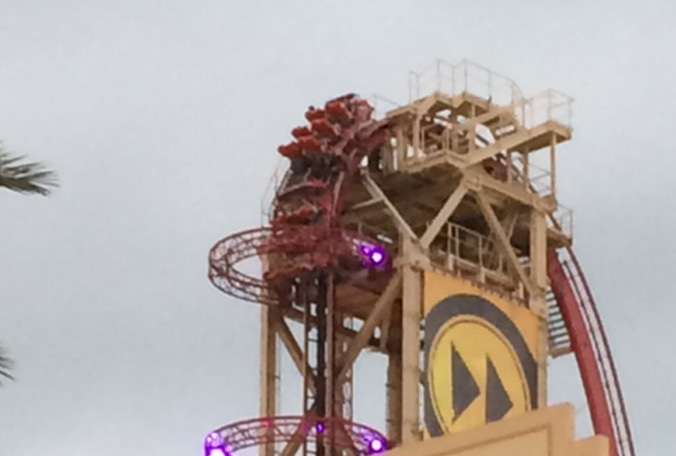 Current reports are saying that it will take 2-3 hours to evacuate the riders from the 17 story coaster. Over it's five year history "Rip, Ride and Rockit" has been plagued with endless problems. At one point the ride didn't operate for nearly a year due to fatigue issues with parts of the Maurer-Sohne X-Car design. This leaves the question of the rides fate, many don't predict it will last much longer and this newest 'stranding' of riders points out a flawed design. In most coasters riders can be evacuated from the lift hill in some form by park staff. Some rides are even designed with a "hand crank" lift hill to get riders to a safe evacuation point. Apparently 'Rip, Ride and Rockit' has none of these features which is why Fire Rescue was called in. 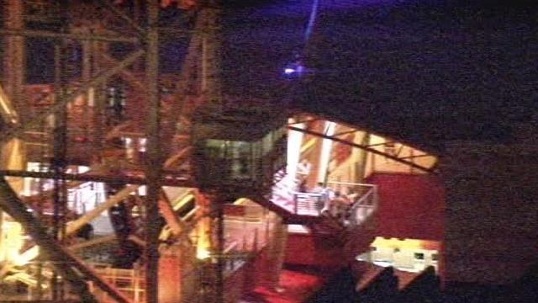 Right now riders are still trapped on the ride. Normally this isn't a big deal as rides do often stop for various reasons from safety stops to computer issues even loading on passengers which take some extra time. However, this makes news simply due to the fact the park isn't able to evacuate the riders on their own but they need outside help. I suspect these riders will be getting some serious perks from Universal Orlando Resort in their near future! We will update on this situation as it happens. Riders still stuck, new video from Central Florida News 13. Firefighters have pulled the frist rider free from the stricken roller coaster around 9:10pm, they are working to free the rest of the people. Universal has not yet made a comment in regards to the breakdown. Apparently the park DOES have a way to crank the ride fully up the lift hill to do an evacuation. The $20 Million Dollar Question is why on earth didn't they do this sooner and why did it require Fire Rescue to accomplish such? Universal still isn't commenting on the incident. District Fire Chief of Orlando Fire Department and a Universal Spokesman confirm it was a "Technical Glitch" which caused the "Hollywood Rip, Ride and Rickit" roller coaster at Universal Studio's Orlando to shut down, stranding riders for over 3 hours on a vertical lift hill. In the end the ride was moved into proper position to unload the riders safely at the top of the lift hill. Universal Spokesman Tom Schroder stated the ride will be closed until technical crews can figure out what went wrong causing the glitch and ride stop. Universal Studio's Orlando Re-Opens "Hollywood Rip, Ride and Rockit" less then 12 hours after Massive Malfunction? !